When I started this blog, writing a series on The Happiness Trap was very motivating and exciting! I couldn’t wait to share the lessons of this book with my readers, because it had helped me so much. 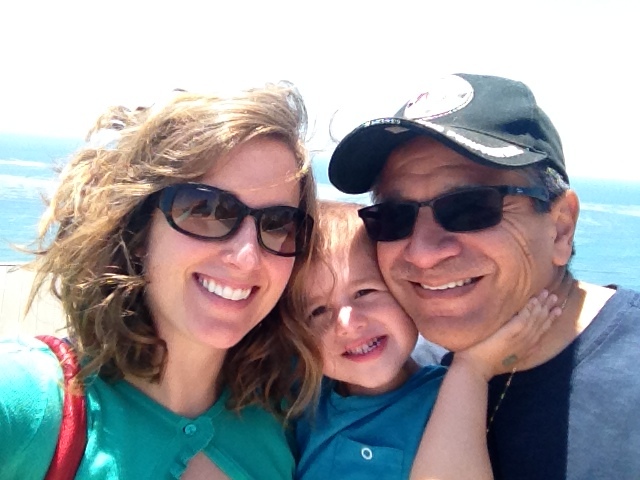 Then, as the weeks turned into months, my inspiration fell off – for two reasons, I think. First, I noted that people weren’t reading or seemingly connecting with posts on The Happiness Trap as deeply as other types of posts. I suppose the lack of enthusiasm was contagious. At the same time, I started feeling less anxiety and didn’t rely on the strategies of the book as frequently. In some way I felt like I was “moving on”. But, then a funny thing happened. My struggle switch got turned on again. 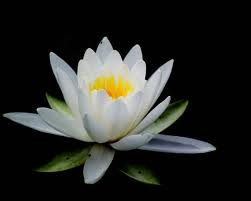 I started to be hyperaware of my thoughts again and began striving to maintain a sense of contentment. In Dr. Harris’s words, I fused with the thoughts that told me I needed to control my thoughts and feelings. It started gradually. As I’ve mentioned, since the end of college, my attitude toward sleep has been the benchmark by which my level of anxiety has been measured. For the past couple months, I’d been consistently falling immediately to sleep at night. I’d finally gotten to a place of acceptance about the sleep issue and that took the power out of my anxiety over it. But, then I started having passing thoughts about how nice it was not to have that source of anxiety and worry in my life. That’s the first step, making a judgment about thoughts and feelings – which are “good” and to be sought after versus those that are “bad” and should be avoided. The switch was flipped. It was clear to me that I’d been using some of the acceptance techniques I’d learned as control strategies. In other words, instead of defusing my thoughts in order to accept them, I’d been expecting to get rid of anxiety and improve feelings of contentment through defusion. Although I felt that my inner world had dramatically changed, perhaps it hadn’t been so extreme. If my newfound approach to life: defusing negative thoughts, being in the moment, and not planning and controlling were really just a new way to maintain a certain level of contentment (and therefore avoid anxiety) – I’d largely missed the point. So, I’ve recently been revisiting The Happiness Trap strategies, partially to get back on track with my blog series, but mostly for my own use. The thing that stands out to me during this reading is how frequently Dr. Harris cautions readers not to use acceptance techniques as control strategies. It’s a thin line. Typically accepting thoughts and feelings will lessen anxiety and other negative feelings, but if we start using these strategies in order to get rid of negative feelings, we’re right back in the happiness trap. Even as I write this, I’m noticing that this “problem” really isn’t a problem at all. What I’ve really been experiencing lately is just a normal, healthy level of emotional ups and downs. I realized that feeling anxiety is acceptable to me, as long as I’m not currently feeling it. I can mentally agree that experiencing negative emotions is a normal part of life and should be expected. But, when those feelings inevitably come, I struggle and try to get rid of them. Along those lines, he writes “Healthy people imagine they can live without their health.” Can’t we all relate to that? We take health for granted until we face the loss of it. Come down with a bad cold or a case of food poising, and nothing else matters until your health is restored. Same with feelings, I’d argue. This seems to me to be a different way of saying that you can embrace the idea of suffering as long as you’re not actively suffering. In some ways, happiness as an “answer” to the problem is fitting. Ultimately, the answer to evil will be that God abolishes it. So in the short run, having evil fade when happiness comes is a sign of the shape of the final answer. When God wipes away every tear on the last day, we will be satisfied. While I think all will be explained, I think many of us would be happy at the restoration of all things, even without an answer. And our current experience seems to suggest this. As I sit here pondering how to conclude this post, I’m back at acceptance. Life in our fallen world includes evil and goodness. We’re going to experience all types of emotions and the painful ones will hurt. While we can’t avoid the pain, we can accept it when it comes. Likewise, we can be open and accepting of happiness when it comes. All we can do is hold onto feelings lightly and know that God is with us regardless of how we feel. 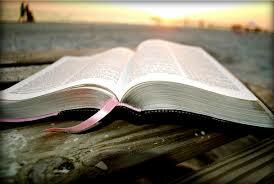 Many Christians have their “go-to” Bible verses. When my anxiety started last July, I went straight to mine and held on for dear life: Trust in the Lord with all your heart, and do not lean on your own understanding. In all your ways acknowledge him, and he will make straight your paths. Proverbs 3:5-6. I prayed this verse and tried with all of my might to feel differently- to trust God, surrender to his direction, and stop depending on myself. But, my feelings weren’t changing. I felt more and more desperate as it seemed to me that my prayers were going unanswered. In the second week of this state, I eagerly anticipated a School Board meeting on a weekday evening. One of the board members was our Deaconess, a woman who I respect and admire immensely. She’s wise, loving, and faithful. Her counsel means so much to me. After our meeting, I asked if she had a moment to talk. After our fellow board members departed, I burst into tears and started explaining what I was going through. Deaconess listened patiently, quietly, and with a look of concern on her face. I cannot recall everything I said (I was kind of a mess), but there were a couple exchanges I’ll always remember. I explained that I had convinced myself that I could stay happy all the time and was now trying to reframe my understanding of happiness. I asked her how she felt about happiness. Deaconess replied, “Something happens that makes me happy, but I don’t think of happiness as a state I try to stay in.” She went on to explain that joy, peace, and hope are always present through Christ. That’s where she dwells, not in happiness or striving to feel good. This was a revelation to me. When I told her how manically I’d been praying the Proverbs verse and desperately trying to trust, she responded, “But don’t make it law.” She was referring to one of Luther’s revolutionary writings – the distinction between Law and Gospel in the Bible. God’s law is what humanity must fulfill whereas Gospel is what Christ has accomplished for us (therefore fulfilling the Law). Her point was clear, this verse is pure Gospel. God is inviting us to trust him, surrender to his will, acknowledge his presence, and allow him to direct our paths. It’s not a directive. It’s not “Thou shalt trust in the Lord…” All of my striving to trust was precisely opposed to the spirit of this verse. This single idea, “… don’t make it law” made the most significant impact on my growth and awakening to a life of surrender. Towards the end of our talk, Deaconess lovingly told me that through this process, “God is deepening your peace.” At the time, I couldn’t fully embrace this idea. But, in hindsight I understand the wisdom of this observation. Through this period of suffering, God did increase my dependence on him and therefore grew and deepened my peace, (hope and joy, too!). The answer came to my mind instantly, the verse that had been in my heart and mind from the beginning – Trust in the Lord with all your heart, and do not lean on your own understanding. In all your ways acknowledge him, and he will make straight your paths. (Proverbs 3:5-6) is about surrender and acceptance of God’s superior will. Acceptance is one of the main lessons of ACT (Acceptance and Commitment Therapy). Through trusting in God, I could fully accept whatever thoughts or feelings came my way. I had the “answer” all the time. The process of growth has been about my ability to accept that there really isn’t anything more I need to do. In other words, I needed to see Christ’s work in my life as Gospel instead of Law. He’s doing all the work and I’m the grateful recipient. I cannot control my life or improve what he has already perfected. 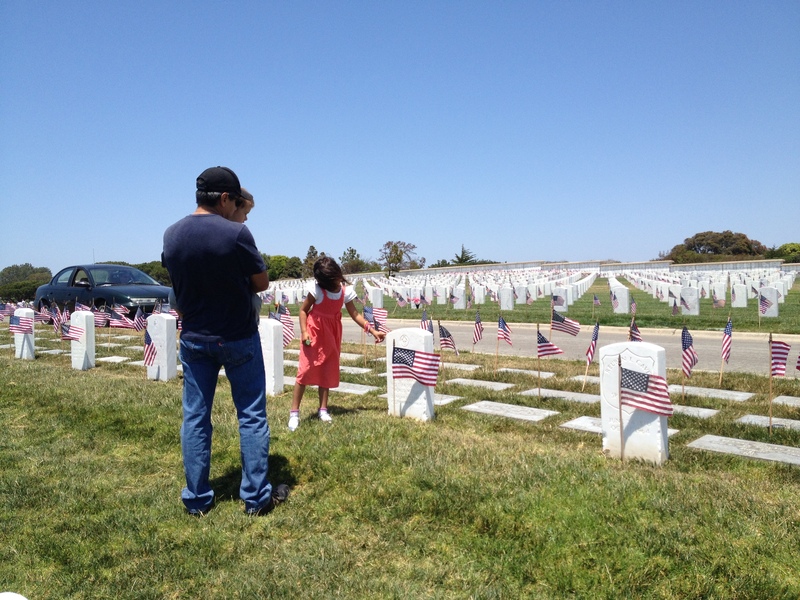 We agreed that we had to do something this weekend to impart the meaning of Memorial Day to the kids. 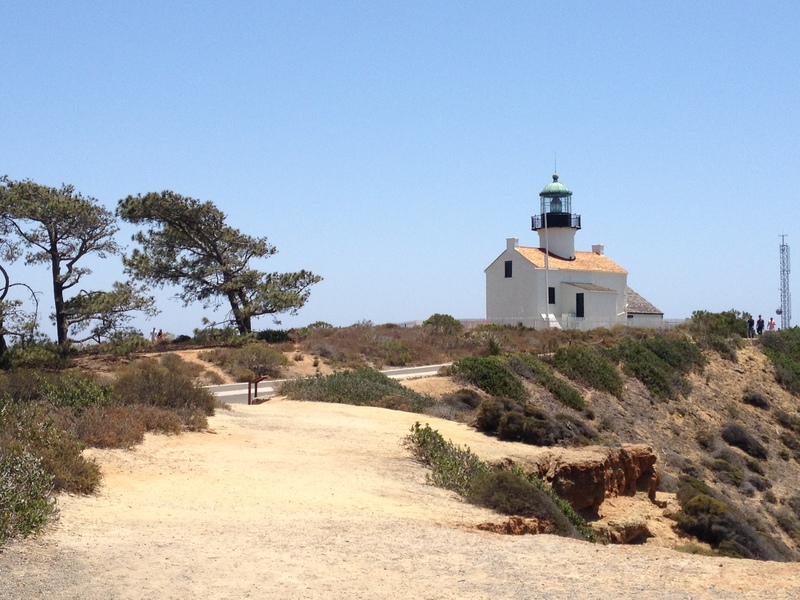 Living in a military town, there were lots of places we could go – we opted for Fort Rosecrans National Cemetery next to Cabrillo National Monument and the Old Point Loma Lighthouse. 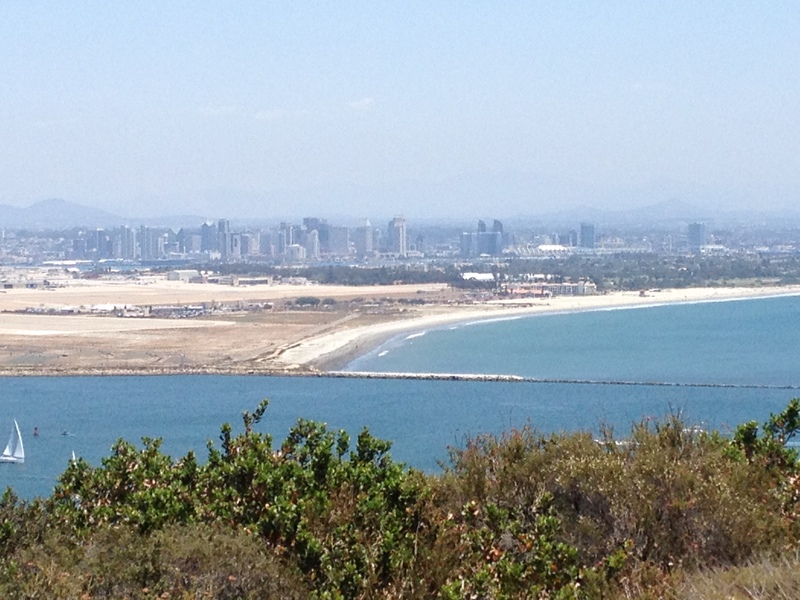 After church yesterday, we headed for Point Loma, grateful that the May Gray had broken up, a nice breeze was blowing and the sun was shining. We drove past the cemetery to tour the monument and lighthouse first. There were a lot of people milling around the entire area, which made the experience feel more patriotic and momentous. 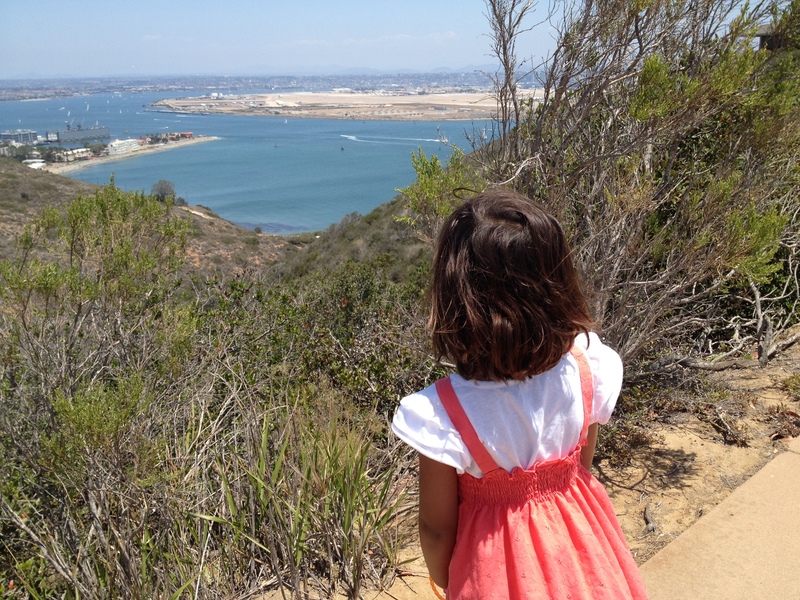 The kids did their typical whinning about walking so far – so we periodically carried them, but mostly they loved the amazing views of San Diego bay, harbor, and the city skyline. It’s pretty tremendous from up there. The lighthouse is awesome! Sienna discovered a cool map of the western Coast of the U.S. with buttons you push to light up the various harbors. We pushed the San Diego harbor button to see it illuminate, and then I pushed the Humboldt Bay button to show her the distance to my hometown. Fun little geography lesson! After exploring the cliffs along the point (and repeatedly telling Sienna she had to hold someone’s hand and NOT walk so close to the edge!) we made our way down the hill to the cemetery. 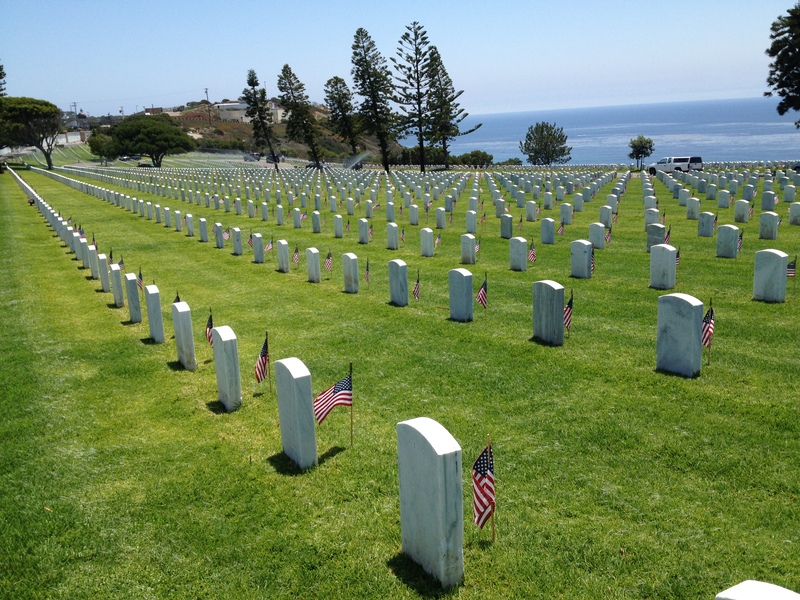 Fort Rosecrans feels like a miniture version of Arlington National Cemetery in Washington D.C. Each time we visit I make this reference and Dennis and I agree that we have to visit it together sometime since he’s never been there. Dennis served in the Marine Corps and is a very proud and patriotic veteran. We walked through the cemetery and explained to Sienna and Mateo that these men and women served our country and many died protecting our freedom. We said a prayer of thanksgiving for everyone who paid the ultimate sacrifice for our freedom and asked protection for the troops currently serving our country. We gave the kids a little speech before starting our tour. We explained what we’d be seeing and how we expected them not to run around, yell, or be disrespectful of the cemetery. They obeyed very well. I’d like to think they’re just obedient, but I think the atmosphere of this place cast a spell on them. They could sense that this was a solumn and important place. Sienna and I looked at headstones and pointed out the husbands and wives and children. There were some that particularly caught our eye, including a veteran from the Spanish American War and several young kids of veterans. As we were leaving the cemetery, we noticed one of the most recently added headstones. It is for a young man who died in Iraq. 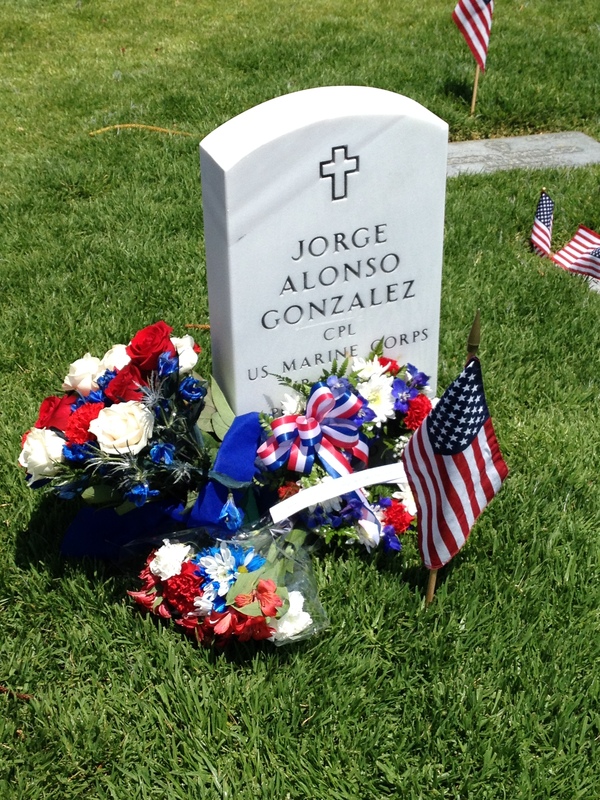 It was decorated with fresh flowers and we imagined that his loved ones had brought them recently – perhaps for his first Memorial Day (we reverantly didn’t move the flowers to check the dates on the headstone). The reality set in. These veterans are each someone’s son, brother, husband, daughter, sister, or wife. The sacrifice of military members and their families is extraordinary and ought never to be taken for granted. As you’ll hear often this weekend – thank a veteran for their service. I’ll thank my favorite vet. Dennis, you are a brave and devoted man. Your family is so proud of your service to our country. Particularly Sienna who just connected her Daisy Scout project of writing to the miliary with her father and responded “My dad was in the Marines? !” with a tone of shock and admiration. Thank you Babe for being the beacon of light that shines on our civic duty to pay respect to our servicemen on Memorial Day and throughout the year. 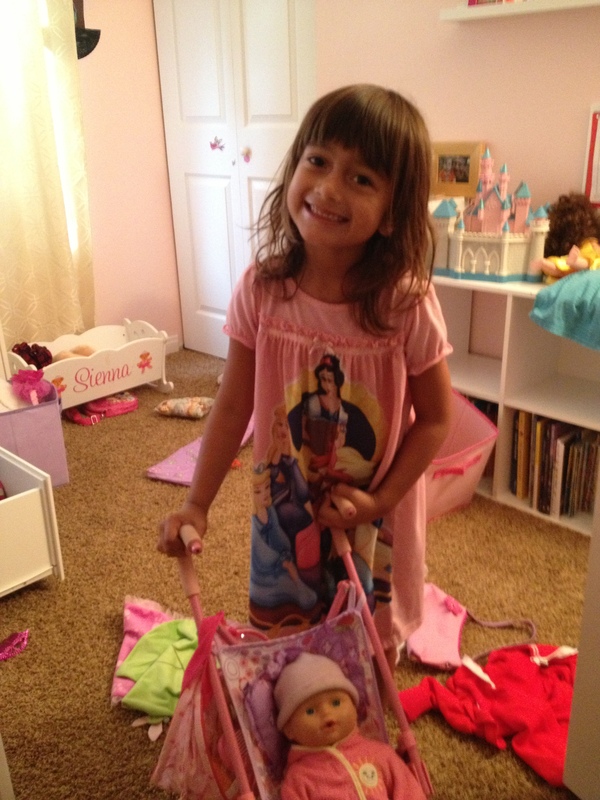 As my awakening began, one of the things I wanted to do more was play with my kids. Sure, we did plenty of trips to the park, zoo, or other family activities, but I didn’t really spend any time sitting on their bedroom floors with them, just playing. They’d often ask, “Mommy, want to play with me?” But I’d usually have something do to – food to prepare, bills to pay, rooms to clean, or something relaxing I wanted to do. For me, ceasing all my planning and being in the moment was epitomized by the simple act of playing with my kids. I’m so happy that I now regularly join in when Sienna and Teo are playing in their rooms – either alone or, more frequently, together. Just entering their world, playing whatever fun game or activity they come up with – it’s pure joy. We connect and enjoy each others’ company and let our imaginations run free. Just today, Sienna came into the kitchen while I was making coffee and asked, “Can we go to Sea World?” I reminded her that we are not spending extra money right now and would probably go to Sea World again in a couple years. Next she asked, “What about Legoland? We’ve never been there.” I smiled and agreed, “We’ll go to Legoland someday.” That seemed to satisfy her and she skipped off. What a great reminder. I thought of the wise quote – “Children spell love t-i-m-e.” Out of all the countless things parents do for their children, what kids really remember is how much focused time we spend with them. Kids don’t need us to spend a bunch of money having an over-the-top experience in order to enjoy quality time together. It’s just about spending time with them and, most importantly, being focused and in the moment with their playtime. I can’t recall when it first started. Probably over a year ago. One night, after the kids had bathed, gotten into their pajamas, and brushed their teeth, we were ready to start reading books. I think it was me that said, “Group hug!” The kids were puzzled, not having heard this phrase before. Dennis and I scooped them into a big hug. They giggled, we giggled. We went on to sporadically do family group hugs before bed. Recently, I suppose now that Mateo is also old enough to prompt the hug habit, we’re doing group hugs at bedtime every night. It’s always right before reading books (the parents and kids switch, back-and-forth each night – which is nice because we all get to have one-on-one time). Typically, either Sienna or Mateo will call out “Group hug!” and we all gather in the entryway / entrance to the kids’ bedrooms / dining area. This is the offical place for group hugs. If we’re all in one of the kids rooms when the group hug is called for, we all troop out to the official hug spot. I’ve thought about how this place is the heart of the home, literally right in the middle of our house – basically the major artery between the bedrooms, living area, and entrance. It’s like our house is encircling and embracing our family! I LOVE this tradition! It’s a sweet, silly way to demonstrate our family togetherness. We each love one another, individually and we love each other as a family. I hope that this continues and becomes part of the Bonilla family culture. I can see us doing group hugs at milestones like graduations, weddings, and other special events. Sienna’s consulting with me about this post. She just told me to write, “Group hugs always make my mom choke up.” She’s right. I love it. 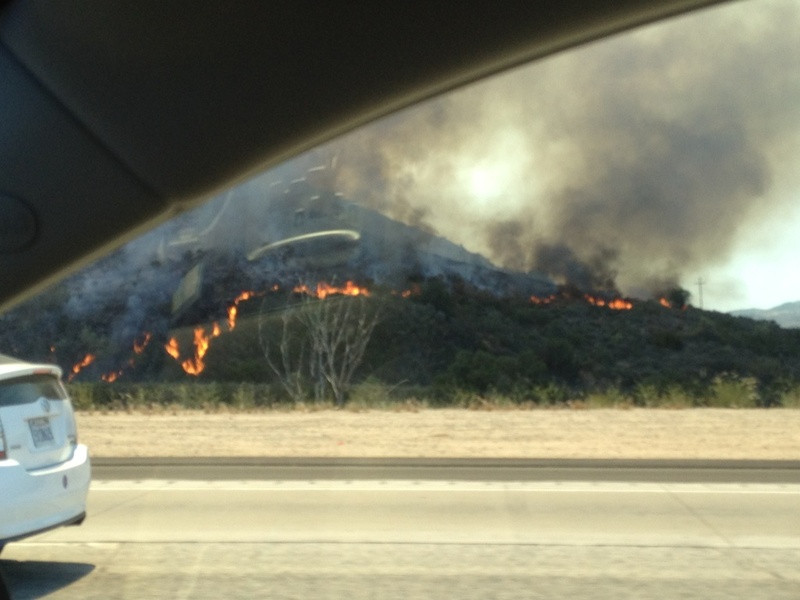 As you may have heard, we’ve been having a rash of brush fires this week in San Diego County. Coming from northern California, I was unfamiliar with the experience of wildfires when I moved down here. Boy, did I get a rough introduction! In late October 2003 I had just started my graduate program in History at SDSU and was dogsitting for a former coworker in Rancho Penasquitos. Dennis and I had been dating for several months and he was hanging out with me for the weekend. It’s a little fuzzy now, but I recall getting onto I-15 south to head downtown and seeing a huge plume of smoke out to the East. It was terrifying! They closed the freeway so we had to make our way back to the house in PQ and tried to figure out what to do. What if the fire got to the house I was sitting? Could I put the two huge dogs in my car and head down-town?? We were glued to the news for the next day. Luckily, our friend and her husband returned the next day and the fire hadn’t burned toward their house. Dennis and I left North County and swung by my house in Clairemont so I could pick up all my photo albums and other irreplaceable items. In retrospect, this was unnecessary – the fire didn’t get anywhere near my neighborhood! Dennis and I hunkered down at his apartment downtown. We stayed inside for well over a day and then ventured out on Monday night to see the Dolphins play on MNF at a bar. They were playing the Chargers and the game actually had to relocate to Arizona because of the fires. The air quality wasn’t great and there was ash all the way downtown. When I returned to my house in Clairemont the next day, there were piles of ash all around. 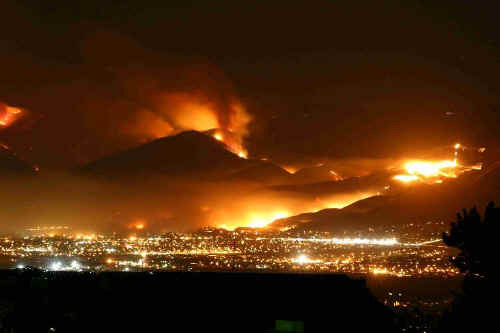 This was the Cedar Fire and it burnt over 280, 000 acres and is the largest fire in California recorded history. Thank you, Wikipedia. When something this devastating is your first experience with wildfires, it tends to skew your perspective. 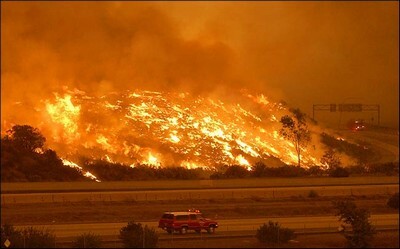 The trio of big fires in 2007 occurred shortly after my mom moved to San Diego. 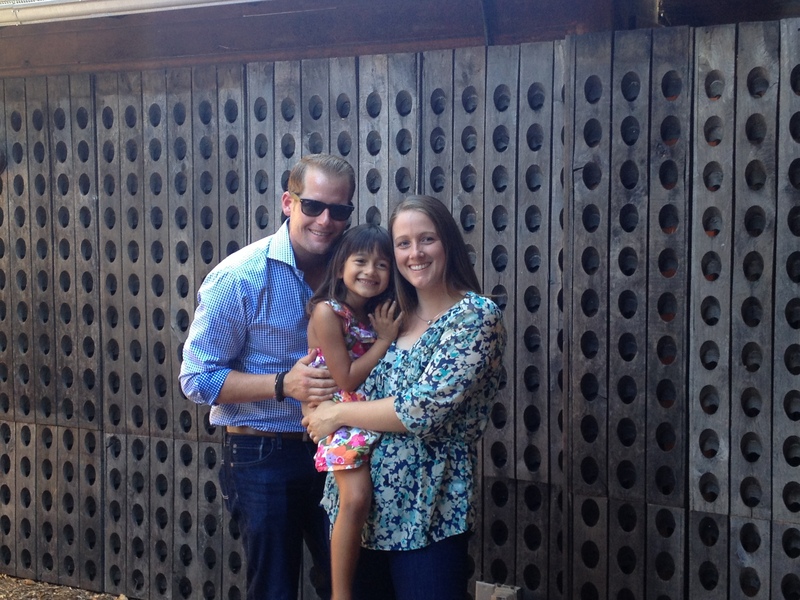 I was nearly 8 months pregnant with Sienna so I worked extra hard to stay out of the smokey air. Between the three of us (mom, Dennis, and me) we lived in the very fire safe neighborhoods of Hillcrest and downtown, so we spent a lot of time watching the news, praying for the victims, and took some donations down to Qualcomm Stadium, but we weren’t concerned about our own homes or personal safety. Our house is in PQ and therefore much closer to dangerous fire conditions than where we’ve lived before. On Tuesday afternoon, my friend, co-worker, and fellow PQ resident, called to tell me she’d received a notice to evacuate because of a wildfire. I don’t pay attention to much news so I didn’t even know there was a fire going on! I got things squared away at work, called Dennis, and headed to pick Sienna up from her after school program. The staff at ESS wasn’t telling the kids about the fire, so I had to be subtle when Sienna exclaimed, “Why are you here so early!” when I showed up before 3:00 p.m. I scooted her outside and pointed up to the big cloud of dark smoke. “That’s not a cloud, honey. It’s smoke.” I told her. As we drove home I explained that a brush fire was burning a little distance away and that we needed to watch the news to see if we were supposed to leave our house. She processed the information and then insisted we pack our bags as soon as we got home. I explained that we probably could wait, talk to daddy, and decide what to do. I felt a bit panicked because my only experience with wildfires have been rather huge! But, I knew I had to be calm for Sienna’s sake. We gave each other big hugs when we got home and watched some of the footage on TV. She asked the big question, “What if our house burns down?” I pulled her on my lap and said, “That would be awful. We’d be very sad. But, if we’re all safe and together, we’d be okay. We would rebuild our house and it would become home because all four of us would be there.” She bravely nodded. Turns out we never had to evacuate. The fire burned away from us and probably only got as close as 5 or 6 miles away. Watching Sienna process this information was hard. I realized that growing up in a region with regular fire danger is something my kids will always deal with. Sienna started drawing pictures of fires that evening. The next day she and Teo played fireman with a rideable fire truck that Teo has had forever without paying it much attention. They were processing it in their own way. So, I headed out, through Anaheim, Corona, and over to I-15 through Temecula to get home. About 15 miles north of Temecula, I could see two huge smoke clouds out to the west. 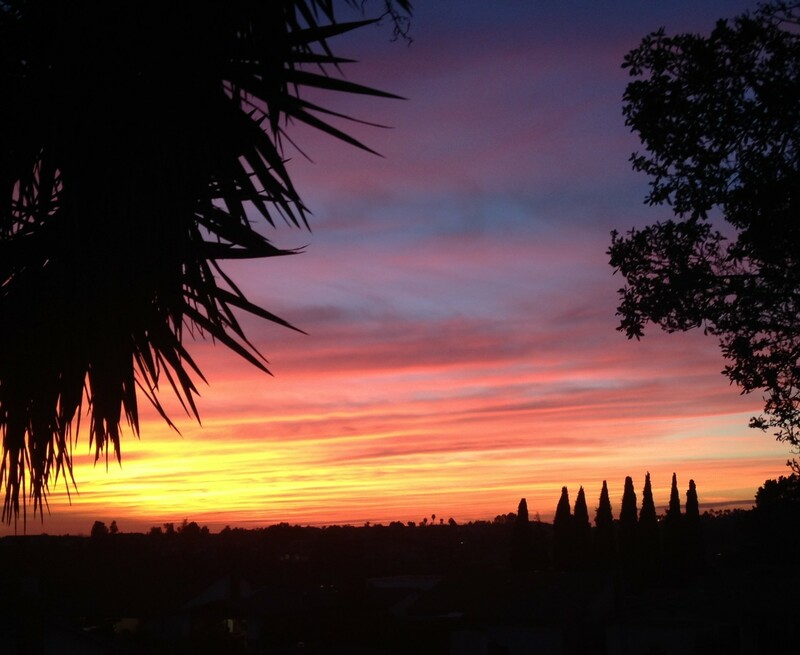 I called Dennis – “That can’t be the Camp Pendleton and Carlsbad fires, can it?” It was hard to gauge the perspective from there. But, as I kept driving, the cloud of smoke grew, until it was pretty obvious I was heading right towards it. I drove faster as I contemplated the possibility that they’d close the freeway and I’d be stuck away from my house and family. 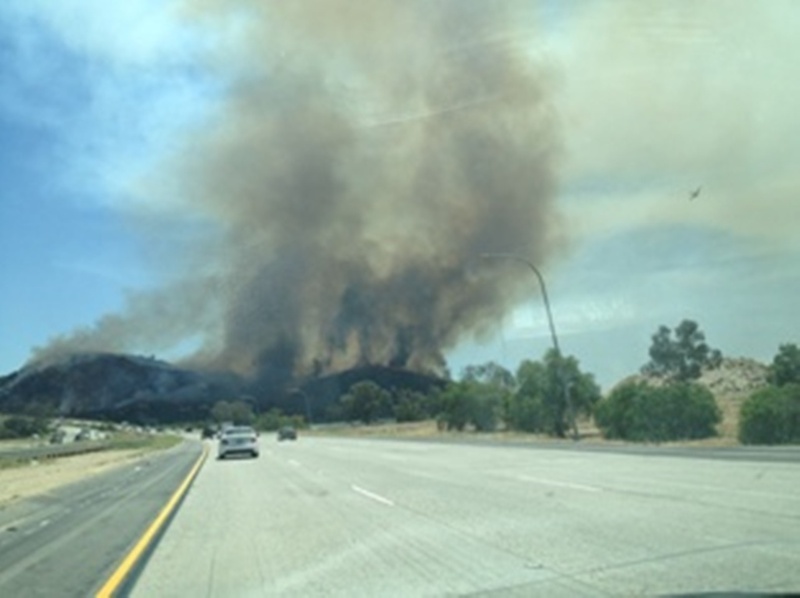 The fire was right off the freeway near Fallbrook. It would come to be known as the “Highway Fire”. As I posted on Facebook, that’s as close to a wildfire as I ever want to be. It’s scary. So, how do we deal with living with fire danger? We’re prepared (we actually need to develop a better plan for what we’d take in an evacuation), have insurance, and pray. We’re lucky to be part of a great community that pulls together to support each other during times of disaster and tragedy. And, we’re very grateful for dedicated firemen and women who risk their lives to protect people and property. Since finishing the book Belong to Me last week, I’ve been thinking about the idea of “belonging”. It’s a notion that I’d previously relegated to the context of childhood or the angst ridden teenage years, as in trying to find your place within a peer group. But, in the book this idea arises from a woman in her mid-thirties and refers to belonging with her husband and family. Fascinating! This has prompted me to question: What does it mean to belong? One of the parenting books I’ve read recently advises that we raise our kids to know they belong in their family. Most teenage rebellion comes from kids thinking that their friends understand them better and that they belong with their buddies more than with their family. I really embraced this idea. It’s important to Dennis and me that Sienna and Mateo think of “the four of us” – our family unit, as the place where they most significantly belong. Just this week, Sienna was telling me and Teo about her friends at school not wanting to play the game she suggested. She felt sad – like she didn’t belong. As I gave her a big hug and said, “We’ll always want to play with you.” I thought about the idea of her belonging with her mom, dad, and brother. There’s a wonderful sense of security for kids when they are home with the people that love them unconditionally. I can already see Sienna making the shift between the comfort and freedom of home and being more cautious and guarded in other settings. Living so far away from our extended family is sad at times. 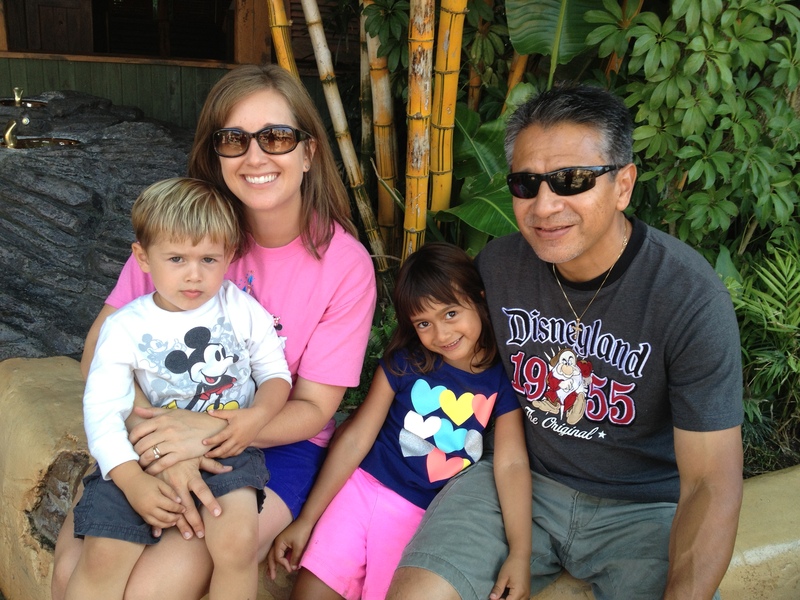 But, we make an effort to make Sienna and Mateo feel connected to their grandparents, aunts, uncles, and cousins. Belonging to a bigger family means a lot to us, even if we don’t see one another as frequently as we’d like. 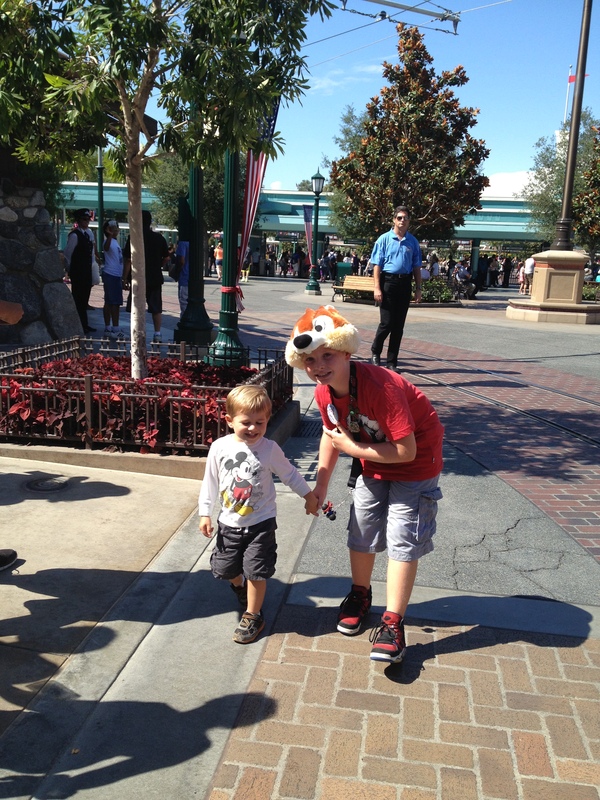 This past summer, my heart about burst watching Mateo holding hands with his “big” cousin Kealan at Disneyland. They’d barely spent any time together before this trip and Teo instantly took to him. It was great to share that time with our little family, my mom, brother, and his soon-to-be wife (at the time), Leah and Kealan. The kids and adults all could sense that we belonged together. When I first moved to San Diego after college, one of the hardest things for me was not having any girlfriends to hang out with. I recall lamenting to Dennis, “There’s no one I can call to just go meet a friend for coffee!” It’s great to have friends and especially wonderful to have a group of friends. All these years later, our church family is like a built in social circle and there are several amazing women that I can call for coffee, lunch, or a walk around the lake. Belonging with the Grace family feels great. In the locker room at the gym last week, a few of us regular swimmers were chatting about Mother’s Day. As we said our goodbyes and “Happy Mother’s Day!” to one another, I smiled to myself. Here’s another place where I get the feeling of belonging. I’m part of this small group of women that come to this particular pool at this particular time. We chat, encourage one another, and have built a comfortable familiarity and community with one another. Truthfully, this last line has confused me over the years. Isn’t the greatest reward Christ? Or the salvation he has won for us? Theology aside, these lines highlight the most important place to belong – in the body of Christ. Our Pastor likes to remind the kids (and parents!) that our fundamental identity is as a citizen of God’s Kingdom. Just as we strive to have our children feel they belong with their family, Christ calls us to belong to His Kingdom above all else. Learning about the concept of vocation helped this verse make sense. God knows that we need one another to live in community and serve each other through our vocations within His Kingdom. Belonging to each other is the natural out flowing of belonging to Christ, as he provides for us through one another.